Part 8 of the Continuous Accounting blog series. You can access the full series here. What could you deliver each day if you had accurate, real-time intelligence? How would your decision-making process change if you had the information you need when you need it? Modern business requires every part of your organization to be forward-looking and strategic. The need for transparency and easy auditability is increasing, and ever more volatile markets are exposing the importance of up-to-date financial data. But with the traditional record-to-report process, most of your month-end close processes are performed during a defined window at the end of the month. This limits visibility and makes it difficult to provide meaningful data until after the books are closed—and the rest of the company is well into the new month. As a result, accountants are out of sync with the broader business calendar and trapped in a never-ending cycle of being left behind. A Continuous Accounting approach changes all of this. It begins with analyzing your current state and examining your processes to determine the areas that need improvement. When your processes are improved and standardized, automating your manual, repetitive tasks is the next step. Process automation provides access to the financial information required to inform better decision-making and gives insight into bottlenecks. It ensures accuracy, and as a result, restores confidence in the numbers. When accountants have real-time visibility into granular information, they can instantly research and correct issues instead of waiting until the end of the month. The organization is then able to shift its focus to driving value for the business, proactively identifying issues and partnering with other teams. Gretchen Sikora, Senior Finance Leader at Dun & Bradstreet, has experienced the transformative benefits of Continuous Accounting first-hand. By using financial close automation, Dun & Bradstreet’s accounting and finance teams were able to eliminate non-value work. Before, accounting staff spent countless hours manually tracking and monitoring the close process. Today, they have the resources to focus on truly critical work, such as analysis and discrepancies, instead of data entry and gathering information for auditors. Enabling accounting teams to spend their brain capital on value-adding activities doesn’t just benefit accountants. It also helps the entire organization become more agile, responsive, and proactive. Real-time access to financial data really is the only way forward, especially with the increasingly complex regulatory guidelines and ever-growing amount of data companies are expected to analyze. By applying the first two principles of Continuous Accounting— improving legacy processes and automating rote tasks with technology—strategic accountants are unleashed to pull the story from the numbers. This gives senior finance leaders timely, accurate, and consumable information, which creates competitive advantages for the broader business. 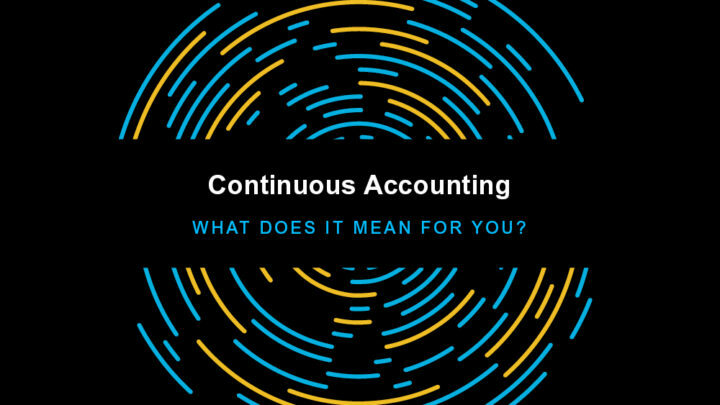 In other words, Continuous Accounting delivers accurate, real-time financial intelligence that enables agile, strategic business decisions and a more effective organization. Read Part 9 to discover the next stage in your Continuous Accounting journey.